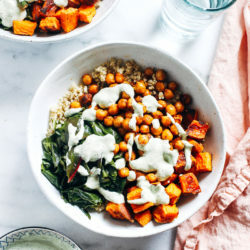 Simple and nutrient-dense, these Buddha Bowls are healthy enough to prep for lunches yet beautiful enough to serve for dinner. One of the most memorable books I’ve ever read was In Defense of Food by Michael Pollen. 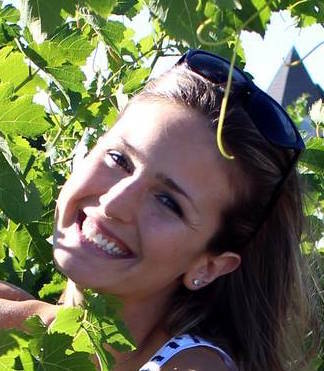 It felt as though a shade had been lifted from my eyes, allowing me to see clearly what exists behind the doors of our country’s food industry. As angry as it made me to learn of the profit-driven atrocities that take place every single day, I knew I wasn’t powerless in making change happen. Every time we sit down to eat, we make a decision on what we choose to support. From organic agriculture to factory farming, it is ultimately our demand that drives the supply. 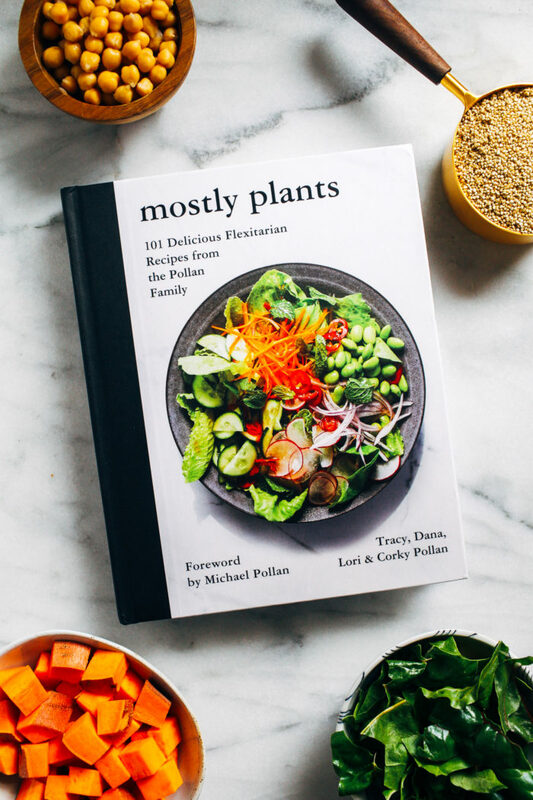 Naturally when I was approached to review the new cookbook Mostly Plants written by Michael Pollan’s family, I was totally on board. Michael’s mother, Corky, and three sisters, Dana, Tracy, and Lori, poured their hearts into this beautiful book. Inspired by family favorites that have nourished them through the years, the cookbook features recipes that celebrate plants as the main focus of our plates. 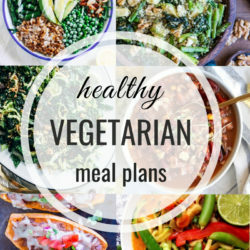 All three sisters are vegetarian or have identified as vegetarian at one point in their life so they recognize the importance of a well-rounded meatless meal. They’re also aware that eating meatless doesn’t work for everyone. 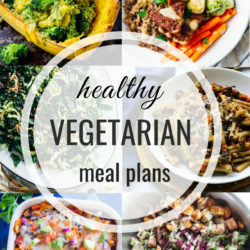 With that in mind their flexitarian approach makes sure there’s room for everyone at the table, omnivores and herbivores alike. Their goal is to shift the ratio from animals to plants, offering delicious and nutritious meals that appeal to everyone. I felt like these Buddha Bowls were a perfect example of that. 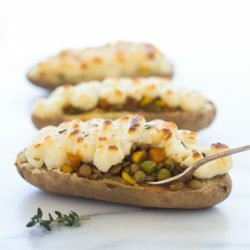 Built with recognizable ingredients that can appeal to almost any palate, they’re packed with flavor and prove that plant-based eating can be utterly satisfying. 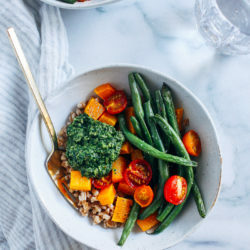 Buddha Bowls are often composed of four elements: a grain, vegetables, a protein, and a sauce. 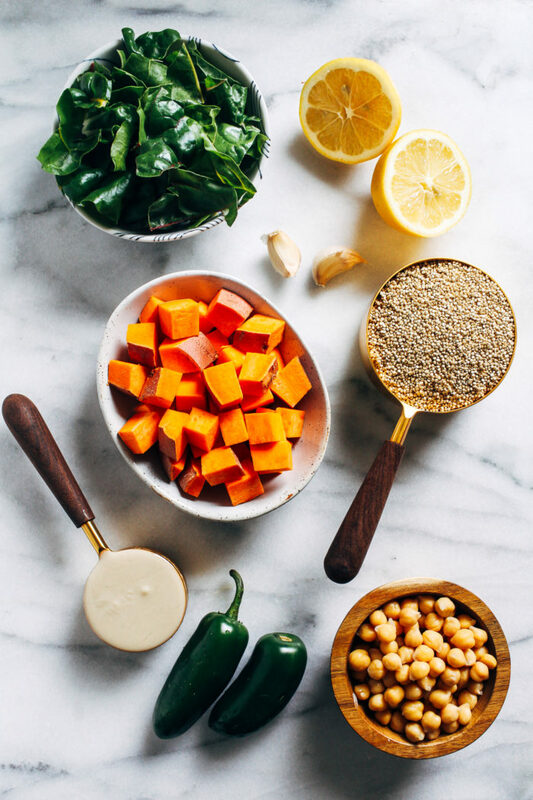 Their version includes your grain of choice, sweet potatoes, swiss chard, chickpeas and a poblano tahini sauce. I had to make a few changes to the recipe based on what I had available to me but the idea is the same. The first step is to prep the tahini sauce. Add all of the ingredients and blend until smooth. I used jalapeño because I couldn’t find poblano peppers. Also, to save time you can make this up to 4 days in advance and store in the refrigetator. Cook your grain: I chose sprouted quinoa. Gluten-free and a complete protein. Winning. Next we roast the sweet potatoes. 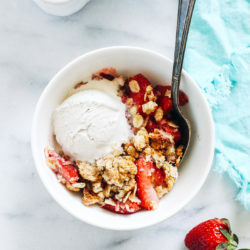 Tossed in coconut oil, maple syrup and lemon zest, you’ll find it difficult to resist eating them all before you make it to the end of the recipe. 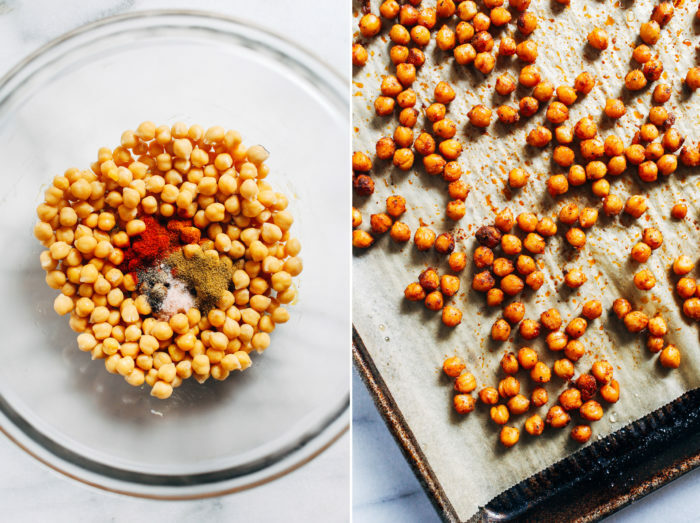 Roast the chickpeas: coated with spices like paprika and cumin, the chickpeas will become delicious crunchy little balls of flavor. Last step! Sauté the chard with garlic and oil for just a few minutes, until wilted. 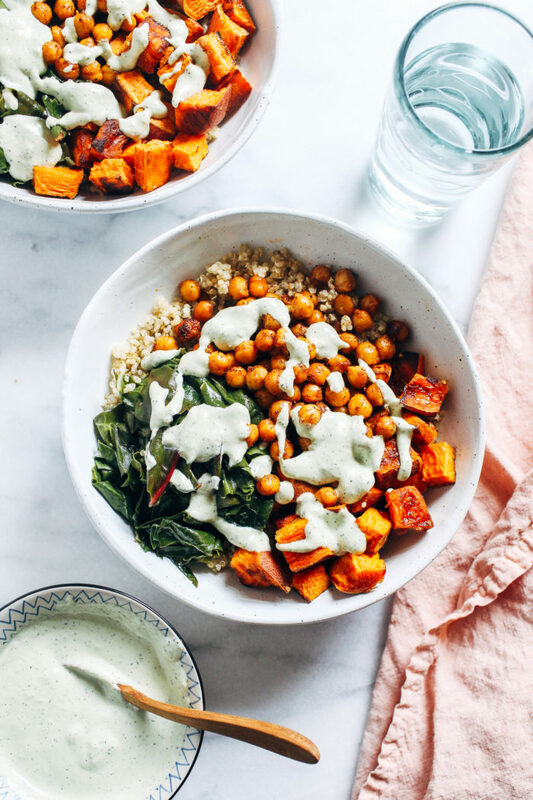 Pile everything in a bowl, drizzle with tahini sauce and enjoy! We found that these reheated beautifully for lunch so they’re great for prepping ahead! I hope you enjoy them as much as we did. If you’re interested in seeing more from Mostly Plants, you can purchase a copy by clicking here. In a blender or small food processor, combine the jalapeño, garlic, tahini, lemon juice, olive oil and 1/4 cup water. Blend until smooth. Add more water as needed to thin, season to taste with 1/2 teaspoon salt and 1/8 teaspoon pepper. Set aside. 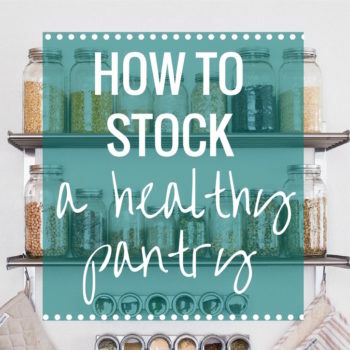 (This can be prepped ahead and stored in an airtight container in the refrigerator for up to 1 week. Preheat the oven to 425°F then line two baking sheets with parchment paper or a silicone mat. In a medium saucepan, cook the quinoa (or other grain) as directed by the package. 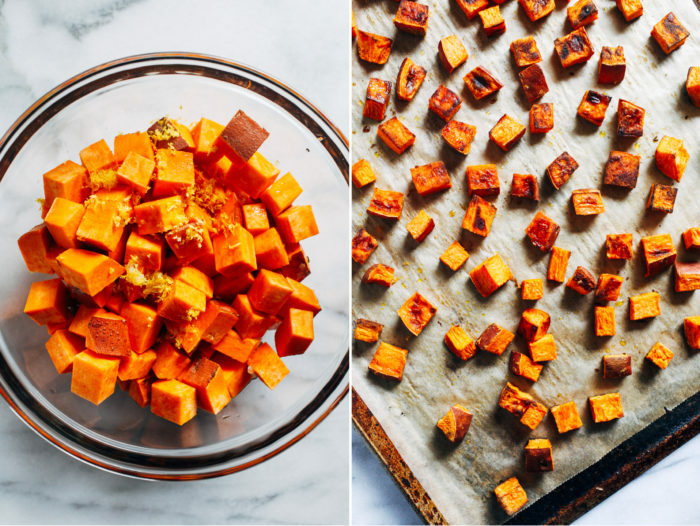 In a medium bowl, combine the sweet potatoes, melted coconut oil, maple syrup, lemon zest and 1/4 teaspoon salt. Mix well until potatoes are evenly coated. Spread out the potatoes on the baking sheet so that there's a bit of room between each one. Roast in the oven for 15 minutes. Remove from the oven and flip the potatoes, then set aside. Meanwhile, in the same medium bowl, combine the chickpeas, 1 tablespoon olive oil, paprika, cumin, cayenne, 1/4 teaspoon salt and 1/8 teaspoon pepper. Mix until evenly coated. On one of the baking sheets, make room for the chickpeas. Spread them out then place them (along with the sweet potatoes) back in the oven for 15 minutes, stirring once halfway through. In a large skillet over medium-low heat, warm the remaining olive oil. Add the garlic cloves and cook until fragrant, about 3 minutes. Add the chard, cover and cook, stirring occasionally, until the chard begins to wilt. Discard the garlic then sprinkle the cooked chard with salt & pepper. Place 1/2 cup of the cooked grain in each of the four serving bowls. 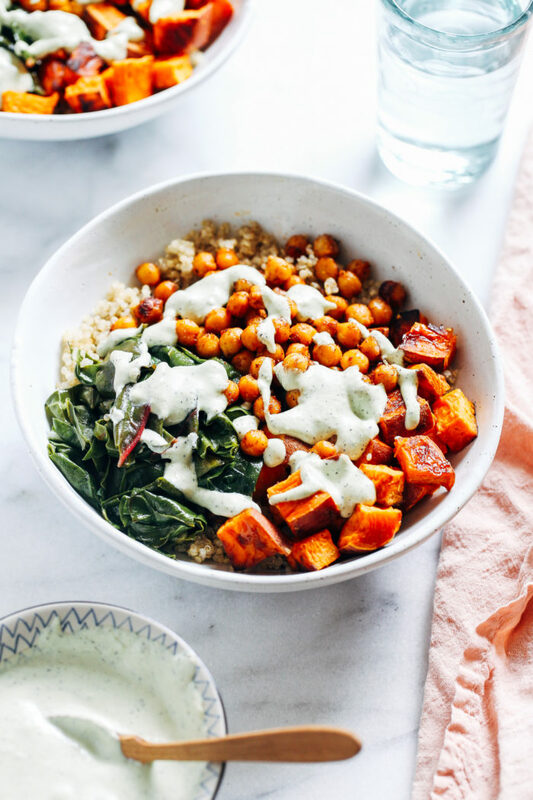 Top with equal portions, sweet potato, chickpeas and chard. Drizzle with tahini sauce, serve and enjoy!